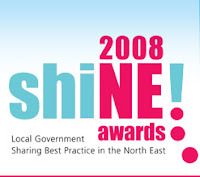 BikeWise Mini-Bike Club has been shortlisted in the final six, of the 2008 SHINE Local Government Awards (Sharing Best Practice in the North East) in the category : The Engaging with Young People Award. The awards are open to North East local authorities and fire and rescue services, as well as their employees. Local authorities can enter in partnership with other local authorities or external partners. The actual awards will recognise local authorities, fire and rescue service and their employees only. The winner of the category will be announced at an awards ceremony held at Gateshead on the 6th March 2008. BikeWise Mini-Bike Club was formed in 2007 in partnership with Durham County Council & County Durham & Darlington Fire & Rescue Service. BikeWise Mini-Bike Club goes International !! "Usually the only contact between the police force and the pocketbikes consists with the arrest of their young pilots at the time of the use of these machines, which is, recall it, completely prohibited on the public highway. In order to stage with the problem of the lack of structure aiming at accomodating these pilot apprentices in a framed way, the English police force of Durham has just set up its own club open to all and even created its own stable of pilot-police officers!" Many Thanks to all who took part in our meeting on Sunday 27th January. The riders & their families/friends for supporting us. A special 'Thank You' to , Andy, Andrew, Carl, Dave, Don, Ivor, Neil, Steve, Stuart & Tim who helped all day with the marshalling & also to the 'start box crew' of Jenky, Jordan, Simon & Tom who kept the riders flowing onto the track & worked quite a sweat up getting all the bikes running !! Our 3rd indoor meeting of 2008 is to be held at Black & Deckers on Sunday 17th February. 1000hrs 'signing on' for a 1030hrs safety briefing/start. The good news is you will see a lot more of it this spring/summer if you are travelling in the Durham Dales & surrounding area's as it will be on the back of Weardale & Arriva buses travelling through the Dales and surrounding area's. The 'Wait A Second' message is something that BikeWise has been promoting for a few years and came about as a a result of a fatal motorcycle accident we had to deal with - so Please... Wait A Second !! If you're already a member of the online 'facebook' community then search for BikeWise and you'll find our online facebook page which you can join. All events will be entered onto the page and you will be able to confirm your attendance .... and also keep up with all our latest news. The photo's from our 1st indoor meeting of 2008 at Black & Deckers, Spennymoor. Many Thanks to all who took part in our 1st meeting of 2008 on Sunday 6th January. The riders & their families for supporting us. A special 'Thank You' to Neil, Andy, Andrew, Dave, Ivor & Stuart who helped all day with the marshalling & also to the 'start box crew' of Jordan, Simon, Jenky & Tom who kept the riders flowing onto the track & worked quite a sweat up getting all the bikes running !! Our 2nd indoor meeting of 2008 is to be held at Black & Deckers on Sunday 27th January. Hopefully there will not be as much rain as in 2007 and we'll all be out on two wheels enjoying our motorcycling. Look out for us on the roads of Durham and have a chat with us to find out what is, or 'is not' happening in the area..
Our 1st meeting of 2008 is to be held at Black & Deckers on Sunday 6th January.